Over the past few months I’ve received a handful of questions regarding to my skincare routine. So, at the request of many of you (thank you for emails, comments and messages! ), today’s post is a detailed review of my most sought after skincare products, treatments and secrets. 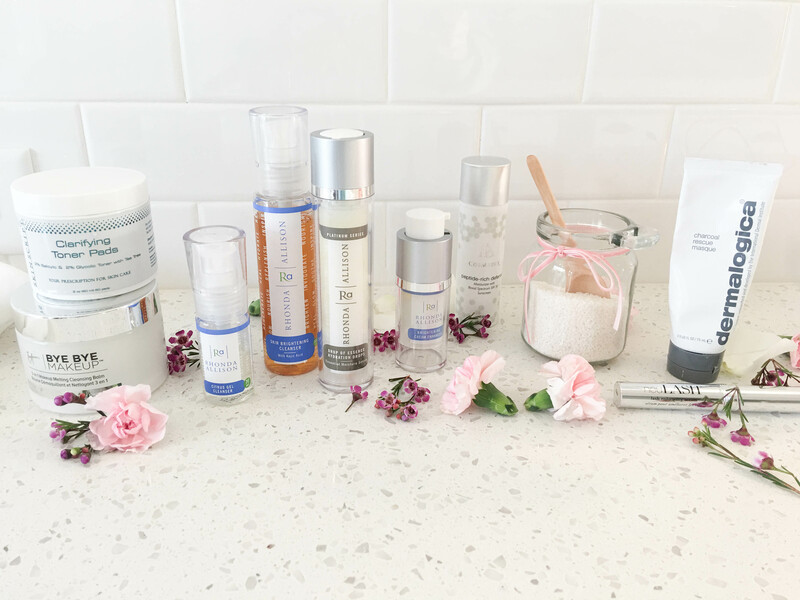 While I’m no expert, I am definitely a self-proclaimed beauty enthusiast and I’ve done a ton of investigating over the years on the secret to maintaining youthful, pristine skin. Additionally, I’d like to think I’ve tried almost 🙂 every product on the market helping me narrow down what I feel is the most effective for my skin type. My obsession with skin care started at age sixteen when I began working as a receptionist at a day-spa here in Charlotte, where suddenly everything my mom had taught me about proper skincare was being reinforced. That coupled with my greatest skincare struggle, hyper-pigmentation or melasma (dark spots that typically appear around the upper-lip, nose, cheeks and forehead), encouraged me to become more proactive in making decisions early on in my life that would pay off in years to come. For those of you unfamiliar with melasma – it can re-appear at any time, making it one of the most challenging skin conditions to treat. 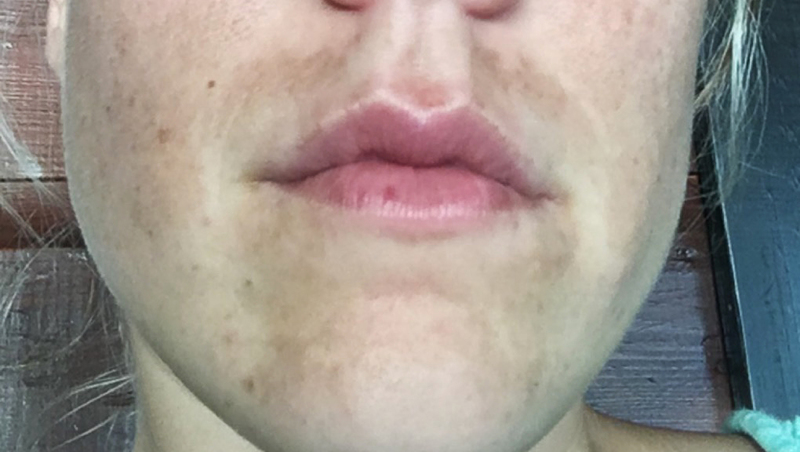 Because of an endocrine disorder that resulted from a rare auto-immune disease, it’s something that I will always face as the prescriptions I take to control the disorder stimulate the appearance of melasma. Severe melasma is very difficult to disguise. Finding a foundation to mask the dark spots can be a struggle of its on. And like so many other women, I too wanted to take a proactive approach in aging beautifully by using products that combat pre-mature aging. Sadly, the ingredients in these preventative products only made the dark spots worse. I even tried organic product lines. It wasn’t until last Summer, the day of our rehearsal dinner, that I visited Kristen of Charlotte Sugaring for the first time. The reason for my appointment was not to address any skincare concerns, but rather to receive a brow treatment before my wedding. During that appointment, Kristen encouraged I come in for a consolation after returning home from my honeymoon. So, I did! The consolation was more or less an exfoliating facial (mild) that allowed Kristin to see the current condition of my skin. And having just spent ten days under the Caribbean sun, I can tell you it was far from glowing. 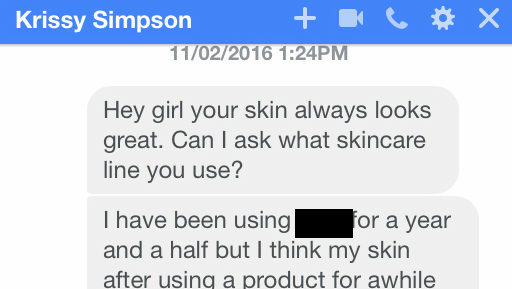 She understood my frustration and concerns, and recommended I try the Rhonda Allison skincare line. Much to my surprise, the products were relatively affordable compared to many of the pharmaceutical-grade products I had tried in the past. 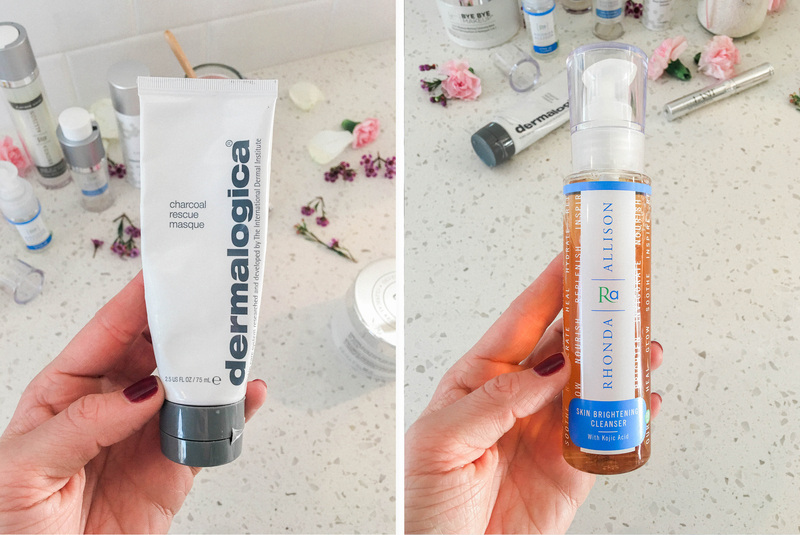 So despite a little skepticism, I purchased a handful of corrective products specifically designed to target skin discoloration, pesky free-radicals and oil buildup. Eight months later I can confidently say that was one of the best investments – of time and patience – I have ever made! I have to thank Kristen for this, as she is the driving force educating me on how to treat and doctor my condition. I also want to disclose that this is NOT a paid or sponsored post. This is simply me wanting to share a product line that has changing my life, given me a boost of confidence and is the result of my new sans-makeup habits! Within three weeks of using the recommended products in addition to a few tried-and-true favorite, which I have listed in great detail below, I saw a tremendous difference in the clarity of my skin. The results were unlike anything I had experienced in the past. My husband, friends and family members would all make comments such as, “You look so refreshed!”, “Are you doing your makeup differently?”, “Your skin looks amazing! What products are you using?”, etc. I was also receiving an unusual amount of feedback from readers, like the one to the right. It was such a great feeling to know that all of my hard work was finally paying off. Below is a photo that was taken on day eight of our honeymoon. I feel is does a great job at showing the true effects that hormonal-induced melasma (which, for me, is encouraged by prescription drugs for a condition I am sure I will explain later) can have on the skin. You can see in the photo that even when wearing full-coverage foundation it’s very difficult to disguise. *These are a collection of products that I have discovered over the years, but have strictly been using throughout the past eight months. As for the Rhonda Allison product line – I’ve recently made a few purchases from a trusted vendor on Amazon, which I have linked below. No 1. Water – A major player in achieving ageless, beautiful skin is none other than good old H20! It’s an essential component that keeps skin cells hydrated while also flushing out impurities and toxins that cause breakouts, acne and rapid aging. No 2. Rhonda Allison Brightening Cleanser – There are few things I love more than a good sudsy cleanser. Something about the bubbles seems more effective, right?! This is a gentle, yet powerful cleanser that removes excessive oil without stripping away the skins softness. It’s also extremely powerful at suppressing melanin. One trick I’ve learned from Kristen is – double cleansing. Give it a try! No 3. SkinScript Clarifying Toner Pads – From time to time my face goes through teenage episodes. This is my secret weapon to warding off blemishing and clogged pores – especially during colder months when I wear thicker moisturizers. It’s a bit pungent, even the smell, but it will clear up even the most severe breakouts. No 4. Rhonda Allison Mega Brightening Serum – Another gem I’ve discovered and use bi-daily is a ‘brightening’ serum. This Vitamin C and antioxidant rich formula is you’re defense in reducing the appearance of acne scaring and sunspots by suppressing melanocytes (the pigment producing cells in our skin). Just a few drops in the morning and night. After a month of using this serum, I have noticed the biggest difference in the clarity and evenness of my skin. No 5. Rhonda Allison Brightening Cream Enhanced – Magic! This cream in combination with the other Rhonda Allison ‘brightening’ products are the trifecta to achieving even, glowing skin! Hands down the best moisturizer out there. I will couple this with Le Mer during the Winter months if I am feeling a bit dry. No 6. 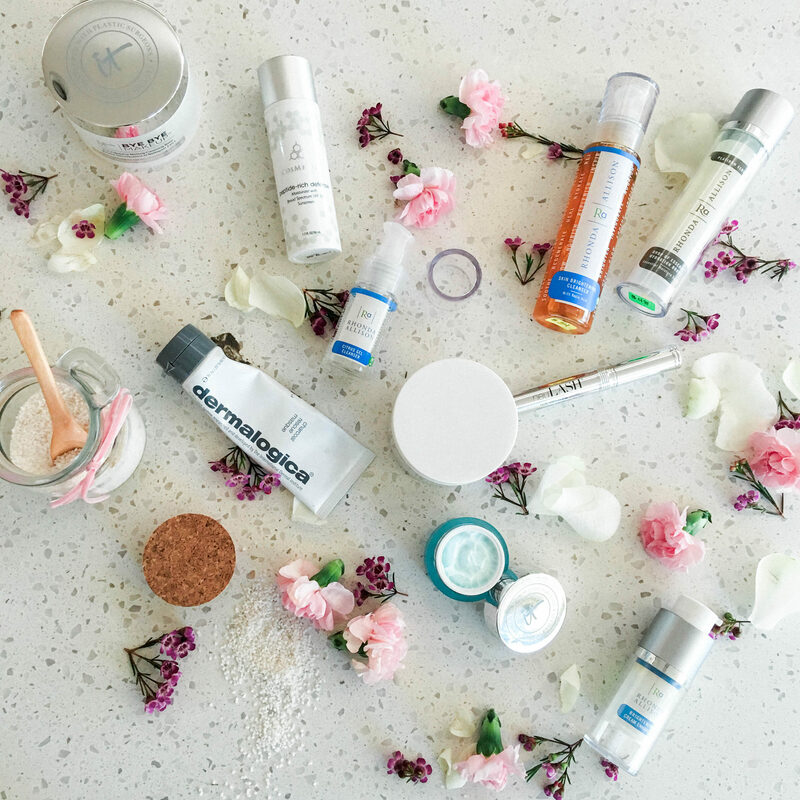 SkinMedica TNS Eye Repair – While some beauty products come and go, there are a few to invest in. Eye cream being one of them. SkinMedica TNS Eye Repair is one of the industries most coveted creams for a reason. It’s deeply conditioning and not only diminishes the look of fine lines and wrinkles, but also surface discoloration like dark circles. I use it in the morning and a little extra at night. I wish I could bathe in this magical potion. It’s that good! Another favorite of mine is Le Mer’s Eye Concentrate. It’s creamy without being too thick or too oily. No 7. EltaMD UV Daily Moisturizer – Unless you’ve been living under a rock, you know that sunscreen is a daily must if you’re at all interested in maintaining the appearance of your skin. I never leave the house without! UV rays from the sun encourage melanocytes to grow – these are cells producing pigment – so it’s vital to wear a quality broad spectrum sunscreen that will block the rays. While most sun protection leaves you feeling oily and smelly, EltaMD will change your thoughts on sunscreen entirely. It’s incredibly light on your skin! No 8. Dermalogica Charcoal Masque – Gold. Pure gold, my friends. This all-in-one masque detoxifies and brightens and has a super fast-acting formula that’s easy to remove. You can see a noticeable difference after just one use! The two main ingrediants – charcoal and sulfur – absorb impurities while also promoting cell turnover. Y’all, just go try it for yourselves. It’s that good. No 9. neuLASH – I am definitely a firm believer in big, bold lashes. And although many mascaras claim to give you that full look, it really starts with the nourishment of your real lashes. I’ve been through almost all of the “lash growth” serums – not intentionally but once I run out of one, I am eager to see if another one works better than the last. Currently lathering my lashes in this before I go to bed. It’s super gentile on my eyes which I can’t say for some of the other lash products that are currently on the market. I also recently picked up the neuBROW serum and extremely pleased with the results. No 10. IT Cosmetics Bye Bye Makeup – I was first introduced to this eye-makeup remover at the Blog Society Conference last Summer in Charleston. It’s ideal for sensitive skin like mine mostly because it doesn’t leave your skin with that oily residue after use. I’m a firm believer on double-cleaning in the evening, so I mainly use makeup remover when wearing liquid foundations (Estee Lauder ‘Double Wear’ is my all time favorite for full coverage) and for removing eye makeup. Remember, gentle downward strokes to your closed eyes to sweep away even the heaviest eye makeup. I am a firm believer in the idea that beauty, in its entirety, is something to be celebrated. Aging gracefully is something that all women strive to accomplish. I’ve found that receiving routine treatments, like peels and exfoliating facials, help to boost at-home, everyday care. I don’t think twice about washing, gently exfoliating and applying products every morning and night. I’m pretty regimented in my routine and have found that I look forward to that much-needed alone time, pampering my skin. Sharing articles like this was my soul purpose for creating Style Souffle – a space where women can learn, be inspired and come together over topics that hit home. I haven’t always had glowing, healthy skin, but after investing time into finding the right products for me , it’s better than ever. If you are experiencing similar issues and would like deeper feedback, please don’t hesitate to contact me. When it comes to skincare, if there’s an issue I’ve most likely dealt with it. My one tip of advice would be: START NOW (if you haven’t already)! For all of my ladies in their early twenties, please know that it’s much easier to maintain than it is to reverse years of neglecting proper skincare! Pictured above is another photo taken last summer. This was probably my worst experience with melasma as a result of my condition. After seven months of using the above products my skin is even and almost completley spot free!